Burbank, Ca – The Martial Arts History Museum is set to unveil its newest addition to martial arts history, the actual karate uniform worn by Elvis Presley when he earned his black belt in the art of American Kenpo. The unveiling, which will take place on Saturday, April 1 at the museum, will also feature a number of artifacts from Elvis’ collection including his flamboyant coat, scarf and sunglasses. Special speaker for the evening is Stanley who spent 17 years growing up with his iconic stepbrother, Elvis Presley. When he was 16, he began working and touring with Elvis as his personal aide and bodyguard. From 1972 to 1977, he did hundreds of shows with his famous brother and was part of some of the most historic concert events of the 20th century. 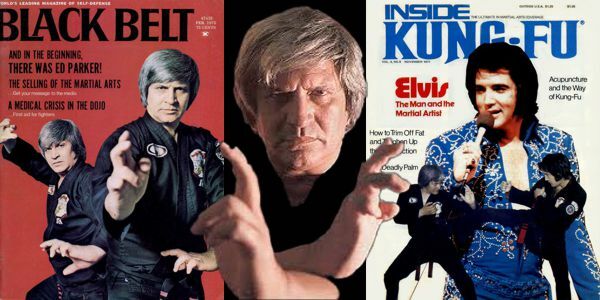 Stanley is also a best-selling author, filmmaker teacher and teacher in the field of self-development and business.This is a going to be a special evening as the museum dedicates the entire event to Elvis and his dedication to music and the martial arts. Earning a black belt from martial arts pioneer Ed Parker, Elvis was proud to put the Kenpo patch on his guitar and a variety of clothing which the museum will have on display. An additional guest will include members of the Ed Parker family. Parker, the founder of American kenpo karate, was one of the most influential martial artists in the world. He created the famous Long Beach International Karate Championships, but he opened the doors to martial arts in television. “Elvis Presley is without a doubt, the biggest celebrity to date that has taken martial arts. He was dedicated to the American art of kenpo karate of which he learned from Ed Parker as he earned his black belt. Having his outfit here at the museum is very exciting and hearing the stories about Elvis from his brother will be fascinating. We are so honored to have his uniform and items donated to the museum,” says museum president Michael Matsuda. The Elvis unveiling will begin at 6 pm to 8 pm at the Martial Arts History Museum located at 2319 W. Magnolia Blvd., Burbank, CA 91506. This is a FREE Event and open to the public. A limited amount of books will be on sale. Further information can be found at http://www.Mamuseum.com or call (818) 478-1722.